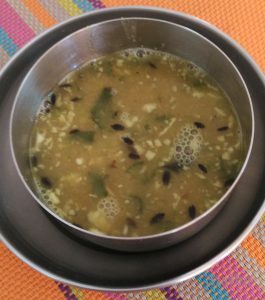 Aamti is a famous Maharashtrian Daal. This is an easy and quick No onion, Garlic recipe. You can have this with Rice or Roti. Some people like to eat it as soup (My husband does so). You need Maharashtrian Goda Masala for this. 1. Wash Toor Daal. Add enough water for it to cool; add ¼ teaspoon Turmeric Powder and 2 drops of oil. Pressure cook the Daal. 8. Boil it for 4-5 minutes. 1. Instead of Kokum / Tamarind, you can add raw mangoes/ tomatoes. Peel and Cut raw mangoes in big pieces(or chop tomatoes in big pieces) ; add them to tadka/tempering, cover and cook for 2-3 minutes and then add cooked Daal. 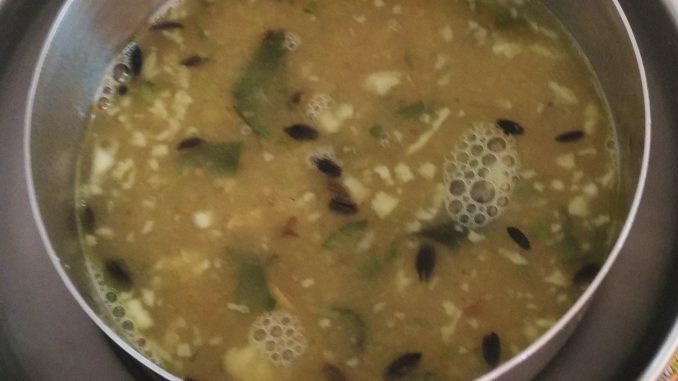 Boil Aamti till Mangoes are cooked. 2. You can add Potatoes. Chop potatoes in big pieces (with or without peel). Add them to Tadka/Tempering. Cover and cook for 2-3 minutes without adding water. Add cooked Daal. Boil Aamti till Potatoes are cooked. 3. You can add drumsticks. For this make pieces of Drumsticks. Boil them in water separately with a pinch of salt. Add cooked drumsticks in Aamti in step 7 above. 4. Instead of green chillies, add chilly powder. Add it in step 7 instead of in Tadka / Tempering.